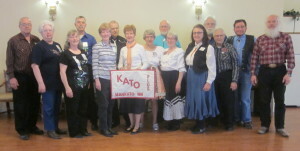 March 24, 2019 – Kato Plus Square Dance, Mankato, Caller Abe Maier. Spares & Pairs, South Metro Stars, St Peter Squares, and County Line Squares danced with Kato Plus. Dancers with Caller Abe Maier.